TLJ Daily E-Mail Alert No. 740, September 16, 2003. September 16, 2003, 9:00 AM ET, Alert No. 740. 9/15. Amit Yoran was named Director of the National Cyber Security Division (NCSD) of the Information Analysis and Infrastructure Protection Directorate (IAIP) at the Department of Homeland Security (DHS). See, DHS release. Yoran was previously VP for Managed Security Services at Symantec. Before that, he founded Riptech, Inc., which provided outsourced information security management and monitoring. Symantec acquired Riptech in 2002 for $145 Million. See, Symantec release. And before that, Yoran was the Director of the Vulnerability Assessment Program within the Computer Emergency Response Team at the Department of Defense. In addition, the DHS's IAIP Directorate and Carnegie Mellon University created a joint effort named the "U.S. Computer Emergency Response Team (US-CERT)". The DHS stated in a release that "The US-CERT will begin as a partnership between the National Cyber Security Division (NCSD) within DHS and Carnegie Mellon's CERT®/Coordination Center (CERT/CC)." The DHS further stated that "The US-CERT will grow to include other partnerships with private sector security vendors and other domestic and international CERT organizations. These groups will work together to coordinate national and international efforts to prevent, protect and respond to the effects of cyber attacks across the Internet. This announcement is the first in a series of upcoming announcements on new partnerships and initiatives within the National Cyber Security Division." Robert Holleyman, P/CEO of the Business Software Alliance (BSA) stated in a release that "Without cyber security, there is no physical security. And recent events like the Blaster worm have underscored just how important it is for the Department of Homeland Security to have a strong cyber security team in place to work with private industry to investigate and prevent attacks on our critical information infrastructure". Holleyman added that "We are pleased that Mr. Yoran, a renowned information security expert, has agreed to take on such a vital role. Mr. Yoran has worked extensively in the public and private sectors to prevent and respond to information security breaches. He knows first hand the vast threats that exist today and what needs to be done to quickly identify, assess and mitigate those threats." 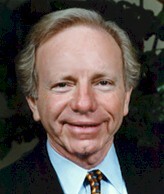 Sen. Joe Lieberman (D-CT), the ranking Democrat on the Senate Governmental Affairs Committee, criticized the Bush administration's cyber security policies. He stated in a release that "The Bush Administration has shown insufficient leadership and offered little guidance on the enormous cyber security problems we face ... Instead, it has left the public sector, the private sector and the average computer user at home to fend for themselves." Sen. Lieberman (at right) added that "We have fallen far behind where we should be ... and frankly, we cannot afford it. The numerous computer worms that plagued Internet systems this year -- and the $12 billion in economic losses that accompanied them -- show just how vulnerable we have become. Unless this Administration takes action soon, we will suffer additional losses." "The Bush Administration issued an extremely vague strategy on cyber security in early February, and has done little since," Lieberman said. "It has shown inadequate attention to the development of a comprehensive and effective plan, much less a timeline for implementing the plan." Rep. Adam Putnam (R-FL), Chairman of the House Government Reform Committee's Subcommittee on Technology, Information Policy, Intergovernmental Relations and the Census, stated in a release that "This is an important step in the progress that needs to be made by our government in protecting the Nation's computers from cyber attack. It is no longer a question of whether our computer networks will be attacked, but when, how often, and to what degree. I share the concerns of government and private sector experts who have testified before my Subcommittee that the United States is not adequately prepared to ward off a serious cyber attack that could cause severe economic devastation as well as potentially contribute to the loss of life of American citizens." 9/15. Secretary of Commerce Donald Evans gave a speech in Detroit, Michigan to the the Detroit Economic Club. He had harsh words for PR China's failure to comply with its World Trade Organization (WTO) obligations regarding enforcement of intellectual property rights and other matters. He reiterated the Bush administration's support for making the research and development tax credit permanent. He advocated reforming class action procedure to reduce the number of "junk lawsuits". He also announced a plan to reorganize all of the trade promotion activities at the Department of Commerce (DOC) into one unit. China. Evans stated that "the President has made a particular point of saying that we are going to enforce international trade laws to ensure that competition is fair. During our round tables, no country raised more attention as a source of concern than China. Concerns ranged from inadequate access to China's markets to the lack of a level playing field in many areas." "Manufacturers complained about rampant piracy of intellectual property; forced transfer of technology from firms launching joint ventures in China; trade barriers; and capital markets that are largely insulated from free-market pressures." Evans recited an example. "Wrigley chewing gum has a 70 percent share of the Chinese market. A Wrigley official told us that the Chinese had pirated their products in the City of Guangzhou. The pirates were selling counterfeit gum. They copied the Wrigley truck. They drove Wrigley’s distribution routes." Evans also stated that "Under the WTO agreement signed in December of 2001, China agreed to let non-bank entities establish financing arms so their consumers could purchase automobiles. We're still waiting." And, he said that "They also promised free access to established distribution systems for American goods. We're still waiting." "But we won't wait idly. We will work to ensure that China honors the commitments it makes", said Evans. Junk Lawsuits. Evans stated that "We strongly believe that fair competition is at the strategic center of both our success and our economic might. Competition leads to innovation. Innovation improves productivity. Greater productivity expands economic growth. And growth improves the standard of living, leading to a better quality of life for all." "We strongly advocate free-market principles and sound fiscal and monetary policies", said Evans. "This much is clear: Unless the indirect costs -- junk lawsuits, health care, and energy -- are brought into line, our historical advantages in productivity and innovation won’t be enough to keep American manufacturers competitive." He quipped that "While manufacturing workers are losing their jobs, the bank accounts of plaintiff attorneys are skyrocketing." "This country was designed to be a nation of laws -- not a nation of lawsuits. The U.S. tort liability system is the most expensive in the world, more than double the average cost of other industrialized nations." He advocated legislation that contains "common sense class action reforms", but offered no further details. DOC Reorganization. Evans stated that "We're creating an Assistant Secretary for Manufacturing to focus on the needs of American manufacturers." He elaborated that "Under this new Assistant Secretary, we're also creating a new Office of Industry Analysis to assess the economic impacts of new rules and regulations." He also stated that "We intend to consolidate all Commerce Department export promotion functions under a new Assistant Secretary for Trade Promotion, who would serve concurrently as the Director General of the Foreign Commercial Service." "And, finally, creating an Unfair Trade Practices Team, within the International Trade Administration, will allow us track, detect and confront unfair competition", said Evans. "These experts will monitor economic data from our global competitors and vigorously investigate evidence of unfair practices." Other Issues. Evans also stated once again that President Bush supports making the research and development tax credit permanent. He also stated that "the President launched a Math & Science Partnership to improve science, technology, and mathematics education." President Bush also traveled to Michigan, but focused on other issues, including energy and the environment. See, speech in Monroe, Michigan. 9/15. Attorney General John Ashcroft gave a speech in Washington DC to the National Restaurant Association in which he stated that claims by the American Library Association (ALA) and others that the Federal Bureau of Investigation (FBI) is using the PATRIOT Act to monitor the reading habits of Americans is "hysteria and hyperbole". Ashcroft (at right) stated that, "Unfortunately, at this moment, Washington is involved in a debate where hysteria threatens to obscure the most important issues." "According to these breathless reports and baseless hysteria, some have convinced the American Library Association that under the bipartisan Patriot Act, the FBI is not fighting terrorism. Instead, agents are checking how far you have gotten on the latest Tom Clancy novel." "Now you may have thought with all this hysteria and hyperbole, something had to be wrong. Do we at the Justice Department really care what you are reading? No", said Ashcroft. He added that "The law enforcement community has no interest in your reading habits. Tracking reading habits would betray our high regard for the First Amendment. And even if someone in the government wanted to do so, it would represent an impossible workload and a waste of law enforcement resources." Ashcroft summed up the requirements of the business records language of the PATRIOT Act as follows: "The fact is that our laws are very particular and very demanding. There are strict legal requirements. A federal judge must first determine that there is an existing investigation of an international terrorist or spy, or a foreign intelligence investigation into a non-U.S. person, and that the business records being sought are relevant to that investigation. Without meeting these legal requirements, obtaining business records, including library records, is not even an option." Section 215. The Patriot Act was enacted in late 2001 after the terrorist attacks of September 11, 2001. Patriot is short for USA PATRIOT Act. This, in turn, is an acronym for the full title of the bill, "Uniting and Strengthening America by Providing Appropriate Tools Required to Intercept and Obstruct Terrorism Act of 2001". The final version of this bill was numbered HR 3162. It became Public Law 107-56 on October 26, 2001. When the ALA and other groups complain about monitoring libraries, they are alluding to Section 215 of the bill. This section amends the Foreign Intelligence Surveillance Act of 1978 (FISA), codified at 50 U.S.C. § 1861 et seq. That is, it is a FISA provision that only applies to foreign powers, and agents of foreign powers, including international terrorists. It does not pertain to Title 18 searches. S 1552. Sen. Lisa Murkowski (R-AK) is not given to hyperbole. However, she has introduced a bill to modify the access to business records section of the FISA. On July 31, 2003, Sen. Murkowski introduced S 1552 [21 pages in PDF], the "Protecting the Rights of Individuals Act", or PRI Act. This bill contains numerous changes to the FISA and the Criminal Code to limit the powers of government to conduct searches, seizures, and surveillance. It revises the provisions in the FISA regarding access to business records. Sen. Murkowski's bill would let stand the basic provisions. However, it would require the FBI to also include in its application to the judge or magistrate "a statement of the facts and circumstances relied upon by the applicant to justify the applicant's belief that the person to whom the records pertain is a foreign power or an agent of a foreign power". Sen. Murkowski's bill would also require the judge or magistrate to find that there is "probable cause to believe that the person to whom the records pertain is a foreign power or an agent of a foreign power". See, Section 4 of S 1552. See also, story titled "Sen. Lisa Murkowski Introduces Bill to Roll Back Surveillance Provisions of PATRIOT Act", July 31, 2003, also published in TLJ Daily E-Mail Alert No. 712, August 6, 2003. 9/15. The U.S. Court of Appeals (11thCir) issued its opinion [43 pages in PDF] in Valley Drug v. Geneva Pharmaceuticals. This is a pharmaceutical industry case -- not a technology case. Moreover, pharmaceuticals have their own regulatory framework. However, the issue in this appeal is the application of antitrust principles to agreements regarding patents, which may be of interest to some technology attorneys. This appeal arising from a collection of private lawsuits brought against pharmaceutical companies alleging violation of Section 1 of the Sherman Act. The complaints allege that two agreements regarding patents constitute contracts in restraint of trade. The case also involves the regulatory framework that is peculiar to the drug industry. The various actions were consolidated in the U.S. District Court (SDFl). The District Court granted the plaintiffs' motion for summary judgment that the agreement are per se violations Section 1 of the Sherman Act, 15 U.S.C. § 1. This interlocutory appeal followed. The Appeals Court reversed and remanded. This case is Valley Drug Company et al. v. Geneva Pharmaceuticals, Inc. and Abbott Laboratories, No. 02-12091, an appeal from the U.S. District Court for the Southern District of Florida, D.C. No. 99-01317-MD-PAS. 9/15. The Federal Communications Commission (FCC) released its notice of proposed rulemaking (NPRM) [75 pages in PDF] regarding the pricing of unbundled network elements (UNEs) and the resale of services by incumbent local exchange carriers (ILECs). The FCC announced, but did not release, this NPRM on September 10. See, FCC release [PDF] of September 10, and TLJ story titled "FCC Announces NPRM To Review TELRIC Rules" in TLJ Daily E-Mail Alert No. 737, September 11, 2003. This NPRM states that the FCC adopted "its current UNE pricing rules, which base UNE prices on the Total Element Long Run Incremental Cost (TELRIC) of a UNE, in 1996 in the Local Competition Order. The Commission stated at that time that it would continue to review its pricing rules based on the results of state arbitration proceedings and provide additional guidance as necessary. We have not undertaken a comprehensive review of the TELRIC methodology in the seven years since it was adopted, and it is appropriate to conduct such a review at this time." The FCC has not yet set deadlines for public comment. These will be announced when the FCC publishes its notice in the Federal Register. Comments will be due 60 days after publication in the Federal Register. Reply comments will be due 105 days after publication in the Federal Register. This is FCC Docket No. WC 03-173. The proceeding is titled "Review of the Commission Rules Regarding the Pricing of Unbundled Network Elements and the Resale of Services by Incumbent Local Exchange Carriers". Also on September 15, the FCC's Office of Strategic Planning and Policy Analysis (OSP) released a paper [PDF] titled "Dynamic Pricing and Investment from Static Proxy Models". The abstract of this paper states that it "evaluates the use of static cost proxy models in setting forward-looking prices, such as the prices set according to the FCC's TELRIC methodology. First, it compares the time paths of prices and depreciation under traditional regulatory accounting with the prices and depreciation implied by various versions of TELRIC. When TELRIC prices are recomputed at intervals shorter than asset lives, the firm will generally not earn the target rate of return. In these cases, a correction factor must be applied to the TELRIC price path in order for revenues to exactly recover investment cost, including the target rate of return. Next, the paper considers a firm's cost minimizing investment decisions under two different assumptions about asset obsolescence. In both scenarios, cost minimizing investment paths and implied utilization rates for the firm’s assets are derived under a variety of assumptions about the relevant input parameters. Some implications for TELRIC pricing are then derived." This is OSP Working Paper No. 40. It was written by David Mandy and William Sharkey. 9:30 AM The House Homeland Security Committee's (HHSC) Subcommittee on Cybersecurity, Science, Research, and Development will hold a hearing titled "The Invisible Battleground: How DHS Is Making America's Cyberspace More Secure". Robert Liscouski, Assistant Secretary for Infrastructure Protection at the Department of Homeland Security (DHS), will testify. Rep. Mac Thornberry (R-TX) will preside. Press contact: Lou Zickar at 202 225-3706. Location: Room 2118, Rayburn Building. 2:30 PM. The Senate Judiciary Committee will hold a hearing on H1B visas. See, notice. Press contact: Margarita Tapia (Hatch) at 202 224-5225 or David Carle (Leahy) at 202 224-4242. Location: Room 226, Dirksen Building. 10:00 AM - 12:00 NOON. The NetChoice Coalition will host a panel discussion titled "Sales Tax on the Internet? Consumer Rights vs. Government Revenue". At 10:00 AM, Sen. Ron Wyden (D-OR), the sponsor of S 52, the Internet Tax Nondiscrimination Act, will speak. At 10:30 AM there will be a panel discussion. The speakers will be David Baker (Earthlink), Tod Cohen (eBay), Maureen Riehl (National Retail Federation), Scott Peterson (Streamlined Sales Tax Project), Rob Atkinson, (Progressive Policy Institute), and Jonathan Chait (The New Republic). Location: Room 608, Dirksen Building. 10:00 AM. The Senate Judiciary Committee will hold a hearing on several pending judiciary nominations, including David McKeague (to be a Judge of the U.S. Court of Appeals for the Sixth Circuit). Press contact: Margarita Tapia (Hatch) at 202 224-5225 or David Carle (Leahy) at 202 224-4242. Location: Room 226, Dirksen Building. 10:00 AM. The Senate Commerce Committee will hold a hearing titled "Consumer Privacy and Government Technology Mandates in the Digital Media Marketplace". This hearing will examine "the consumer privacy implications of the use of subpoena powers by copyright holders to obtain the identities of Internet subscribers allegedly infringing on their copyrights" and "whether the government can mandate content protection technologies without limiting consumers' legal uses of digital media products". The scheduled witnesses are William Barr (General Counsel of Verizon), James Ellis (General Counsel of SBC Communications), John Rose (EVP of EMI), Carey Sherman (President of the RIAA), Alan Davidson (Center for Democracy and Technology), Lawrence Blanford (P/CEO of Philips Consumer Electronics North America), Jack Valenti (Ch/CEO of the MPAA), Christopher Murray (Consumers Union), and Edward Felten (Princeton University). Press contact: Rebecca Hanks (McCain) 202 224-2670 or Andy Davis (Hollings) at 202 224-6654. Location: Room 253, Russell Building. 10:00 AM. The Senate Governmental Affairs Committee will hold a hearing "to examine what can be done to ensure the future viability of the U.S. Postal Service". On July 31 the President's Commission on the United States Postal Service issued a report [208 pages in PDF] titled "Embracing the Future, Making the Tough Choices to Preserve Universal Mail Service". This report recommends that the USPS stop providing electronic and internet based bill presentment and payment, money transfers, certified mail, and data transmission services. See, story titled "Presidential Commission Reports on USPS and E-Mail" in TLJ Daily E-Mail Alert No. 710, August 4, 2003. Location: Room 342, Dirksen Building. 3:00 PM. The House Homeland Security Committee's (HHSC) Subcommittee on Cybersecurity, Science and Research and Development and Subcommittee on Infrastructure and Border Security will hold a joint hearing titled "Implications of Power Blackouts on America's Cyber Networks and Critical Infrastructure, Part II". The witnesses will be Robert Liscouski (Department of Homeland Security), Denise Swink (Office of Energy Assurance), Col. Michael McDaniels (Assistant Adjutant General for Homeland Security, State of Michigan), and Robert Dacey (Director of Information Security Issues, GAO). Location: Room HC 5, Capitol Building. 10:30 AM. The Senate Judiciary Committee is scheduled to hold an executive business meeting. See, notice. Press contact: Margarita Tapia (Hatch) at 202 224-5225 or David Carle (Leahy) at 202 224-4242. Location: Room 226, Dirksen Building. Day two of a three day conference titled "Telecommunications Policy Research Conference". See, conference agenda and registration form. Location: George Mason University School of Law, Arlington, VA.
Day three of a three day conference titled "Telecommunications Policy Research Conference". See, conference agenda and registration form. Location: George Mason University School of Law, Arlington, VA. Deadline to submit comments to the Executive Office of the President's (EOP) Office of Science and Technology Policy's (OSTP) National Science and Technology Council's (NSTC) Subcommittee on Research Business Models regarding the relationship between federal agencies and researchers. The NSTC published a notice in the Federal Register stating that it "is undertaking a review of policies, procedures, and plans relating to the business relationship between federal agencies and research performers with the goal of improving the performance and management of federally sponsored basic and applied scientific and engineering research. As part of that effort, the Subcommittee will hold a series of regional workshops in the Fall of 2003 to solicit input and feedback from the research performer community. This notice is intended to collect data that will assist the Subcommittee in setting agendas for those regional workshops." See, Federal Register, August 6, 2003, Vol. 68, No. 151, at Pages 46631 - 46632.